Benefit #1: Weight Management Plain almond milk without added sugars or flavoring contains 60 calories per each 8 oz serving size. Benefit #2: Heart Health Almond milk contains no cholesterol and only 5 mg of sodium per serving. Consuming foods low in sodium and cholesterol help us to maintain better heart health and normal blood pressure. 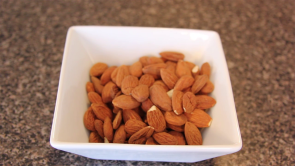 Benefit #3: Blood Sugar Friendly Unlike other milk alternatives, the plain almond option contains only 8 grams of carbohydrates per serving. The 7 grams of sugars that make up the carbohydrate content have a limited affect on our blood sugar levels. When we consume simple sugars, our metabolic functions tend to miss the nutrients, storing much of the carbs as fat. Benefit #4: Bone Health Almond milk contains 30% of our recommended daily value of calcium and 25% of Vitamin D. These nutrients work together to build strong bones in men, women, children and infants. Benefit #5: Skin Care Every serving of pure almond milk contains 50% of our recommended daily value of Vitamin E. This powerful nutrient has antioxidant abilities in that it helps regulate Vitamin A use and availability. Benefit #6: Eye Health The moderate levels of Vitamin A found in almond milk helps keep our eyes functioning properly. Vitamin A directly influences the eye’s ability to adjust to differences in light. Benefit #7: More Muscle Power Even though almond milk only contains 1 gram of protein per serving, it does contain B Vitamins in the form of riboflavin, plus other muscle regulating nutrients like iron. Each serving of almond milk contains about 4% of our recommended daily intake of iron, which helps muscles absorb and use protein for energy, growth and repair. About Samantha Gladish and Holistic Wellness: Samantha Gladish is a Holistic Wellness Coach helping people transform and nourish their mind, body and spirit. Through personal consultations, workshops, social media and her website, Samantha’s insights and advice inspire readers and clients to be more conscious in their lifestyle choices so that they too can experience a higher level of well-being. Besides her long-time love for experimenting in the kitchen and obsession with eating the highest quality ingredients, Samantha is a firm believer in the power of food as medicine. She devotes herself to finding deliciously satisfying yet nutrient-dense whole foods to design recipes that her subscribers and clients get to enjoy, thrive on and always come back for more! She uses her passion and expertise to share simple and sustainable methods of stress management, detoxification, hormone balancing, green living and more!